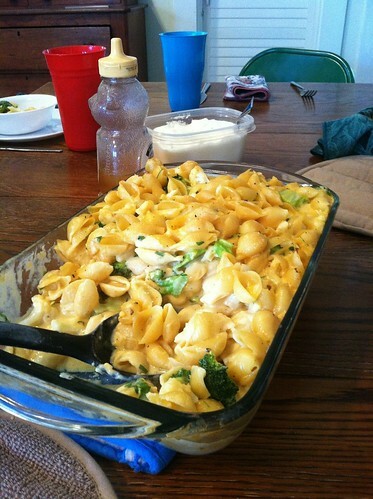 This evening, because it is “Meatless Monday,” I made Cheesy Baked Shells and Broccoli for supper. It was very good and everyone liked it. Except for our oldest daughter who does not like broccoli. She wouldn’t even taste it. She is good-natured about making her own meal if she doesn’t care for what I prepare, which is the general rule of thumb around here. While I do ask and include what they would like to see on the menu, I don’t avoid making things they don’t like. When that happens, they know how to make something they will eat. But back to tonight’s fare. It was easy to make. I did add a few things, so will give the recipe as I made it. Follow the above link to the original recipe. Preheat oven to 350*. Spray a 9×13 pan or 3 quart casserole dish with cooking spray. Bring a large pot of water to a boil. Add the pasta and bring back to a boil. Boil one minute, then turn the heat off. Add the broccoli (and/or cauliflower and/or carrots). Leave in the hot water for three minutes. Drain. The pasta and veggies will continue to cook in the oven, so don’t overcook them at this stage. Meanwhile, make the sauce. Heat the butter until melted. Add the flour and whisk till combined. Cook for a minute. Add the milk and whisk. Cook on low to medium heat, stirring now and then. Add the garlic, nutmeg, salt, and pepper. Cook for several minutes, until it begins to thicken. Turn heat to low. Add the cheese and stir until melted. Add the sauce to the drained pasta and vegetables. Stir in the parsley. Pour the pasta mixture into the baking dish. Bake at 350 for 20-30 minutes, till hot and bubbly and lightly browned. Don’t leave out the nutmeg. It may sound like an odd ingredient if you haven’t used it in pasta before, but it adds an extra layer of flavor without making the pasta taste like nutmeg. 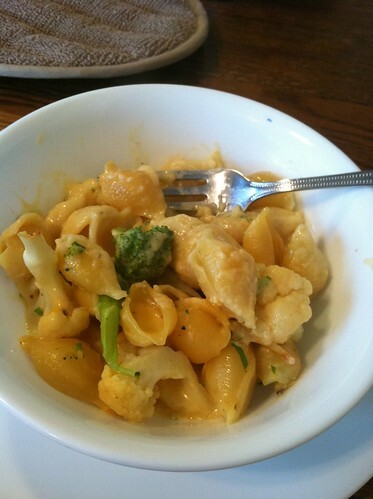 This dish would be good with carrots in it, along with the broccoli and cauliflower. I thought pearl onions would be good in it, too. Or make it with asparagus. Our younger daughter thought it would be good with chicken and she’s right. Next time, we’ll try it that way. This entry was written by ~~Rhonda, posted on March 18, 2013 at 10:29 pm, filed under Recipes. Bookmark the permalink. Follow any comments here with the RSS feed for this post. Post a comment or leave a trackback: Trackback URL.